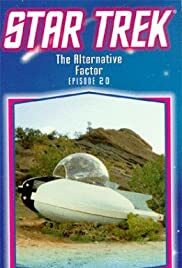 Existence itself comes under threat from a man's power-struggle with his alternate self, with the Enterprise's strained dilithium crystals presenting his key to a final solution. Dr. McCoy: He's in a lot of pain! Capt. Kirk: Sometimes pain can drive a man harder than pleasure. I'm sure you know that, Doctor! This episode of TOS suffered from a mediocre script and very average directing. Robert Brown does a fair job of performing the rather maniacal Lazarus -an interesting biblical allusion, but a bit difficult to interpret the meaning given the character. The cinematography and the script impose limitations that inhibit dramatic development. The Alternative factor is essentially a sci-fi mystery (hence the choice of Gerd Oswald, known for Perry Mason, as the director). It presents a plot with some interesting, though somewhat impossible, roots in theoretical physics. The known universe is, apparently, about to be destroyed by a malevolent humanoid from the universe of antimatter. Lazarus has been chasing this being for years - to exact revenge for the destruction of his world. The Enterprise crew is stymied and confused (as will be most members of the audience), until the identity of the would-be destroyer is revealed. Basically, the story line could have been interesting given an hour or so more explanation. As it stands, it appears to be strafed with plot-holes and inconsistent characterization. The franchise, however, learned from its mistakes and did better with similar approaches in a few episodes of TNG and DS9.